This product has been replaced. Please see the DrumCore 4 Upgrade info. DrumCore 3 sports a "Sunburst Finish" user interface, over twice as much content as DrumCore 2.5 and is now a plug-in! DrumCore 3 gives songwriters and composers access to grooves and instrument sounds of over a dozen famous drummers and percussionists. It includes a library of both audio loops and MIDI grooves plus a software drum instrument for Mac® and PC. DrumCore covers a multitude of styles – including rock, blues, country, metal, prog, alt-rock, pop, jazz, urban, funk, Latin, reggae and others. Please Note: See ReWire info below after reading about the new features. DrumCore v3 features a “sunburst” user interface with a number of enhancements. Easily search and audition the vast number of grooves in DrumCore 3 using List View in the updated Groove Browser. Creating more authentic drum parts is easier as content is arranged into song-like GrooveSets, that group related loops, fills and variations together. New v3 content features a larger number of intros and endings in addition to the usual verse/chorus variations. DrumCore 3 now supports searching via metadata that includes drummer, musical style and “Feel” including shuffle, swing, 1/8th, 1/16th, etc. Drag and drop export of audio and MIDI to a track is supported with all popular music/recording applications (including 32-bit only versions of Acid®, Cubase®, DP®, GarageBand, Live™, Logic, Pro Tools®, Reaper, Sonar®, Traction®, and more). DrumCore 3 supports only 32-bit hosts. See DrumCore 4 for 64-bit. DrumCore 4 and Upgrade Pricing. DrumCore does not currently work with RiffWorks. if you are looking for drum content for RiffWorks, please refer to the RiffWorks InstantDrummer category. A huge selection of bread-and-butter songwriting beats have been added. Expanded jazz content featuring Seattle jazz drummer Gregg Keplinger . A portion of DrumCore's Urban GT” MIDI-only expansion pack is now included, which features classic hip-hop and modern R&B MIDI grooves plus 24 subwoofer-slammin’ drumkits. Drumkits and grooves from Seattle rock/alternative legend Matt Cameron (Soundgarden, Pearl Jam). All of the TempestaPack II expansion pack ($79 value) featuring additional kits and GrooveSets by metal drummer John Tempesta (Rob Zombie, Testament, Helmet) including 007, Fort Apache, Freud and McLay. New grooves by Jane’s Addiction drummer Stephen Perkins. The LiveDrummer DrumCore 3 MIDI engine enhancements provide greater realism for drum rolls and cymbal performances. Tired of “machine gun” playback? Grab the LiveDrummer slider and get more dynamics into your groove! DrumCore 3 is a plug-in for easier integration with all the popular recording applications. DrumCore Toolkit is a standalone application that can be used for importing your audio and MIDI loop libraries as well as for building drumkits using WAV or AIFF files. It is also great jamming with the grooves in DrumCore or for using live with a controller. DrumCore 3 features these celebrity drummers - click for bios: Jeff Anthony (Sheryl Crow), John Bishop (Ernie Watts), Terry Bozzio (Missing Persons), Tony Braunagel (Bonnie Raitt), Matt Cameron (Soundgarden), Luis Conte (Sergio Mendes), DJ Syze-up (UltraNaté), Ned Douglas (Dave Stewart), Sly Dunbar (Marley), Greg Keplinger, Stephen Perkins (Jane’s Addiction), Matt Sorum (Velvet Revolver), John Tempesta (Helmet), Michael Shrieve (Santana), Ben Smith (Heart), Alan White (Yes, Lennon), Lonnie Wilson (Brooks & Dunn) and Zoro (Lenny Kravitz). Get even more content from many of the drummers above by purchasing their add-on packs in DrumCore 4. DrumCore 3 users used to be able to expand their DrumCore 3 library with add-on DrummerPacks that were available in Sonoma's online store. All DrummerPack content is being migrated into the DrumCore 4 built-in store, and will no longer be sold as DVDs and downloads from Sonoma's online store. If you have DrummerPacks that you purchased for DrumCore 2.5 or DrumCore 3, and you purchase a DrumCore 4 upgrade, you will receive a Content Migration Tool to move that content into DrumCore 4. 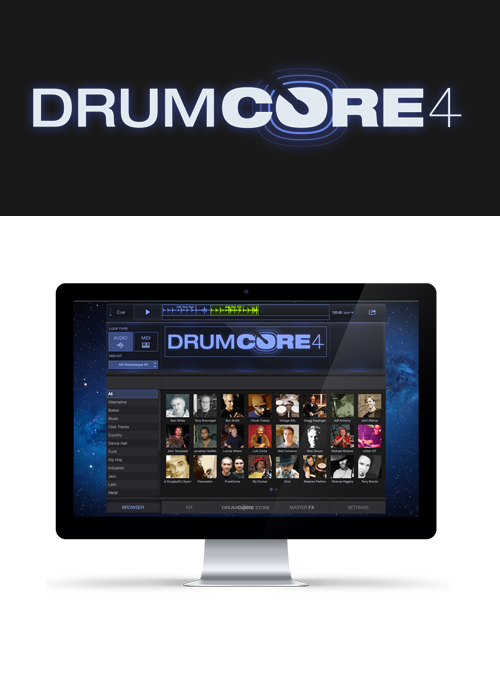 Upgrade to DrumCore 4 in order to add more content to DrumCore by purchasing it from the built-in store in DrumCore 4. Add-on content features additional loops, fills, variations, and single drum hits from some of the best drummers on the scene today across a broad spectrum of styles. Use these drums in your songs royalty free. All the recordings are 24 bit and fully tempo adjustable. 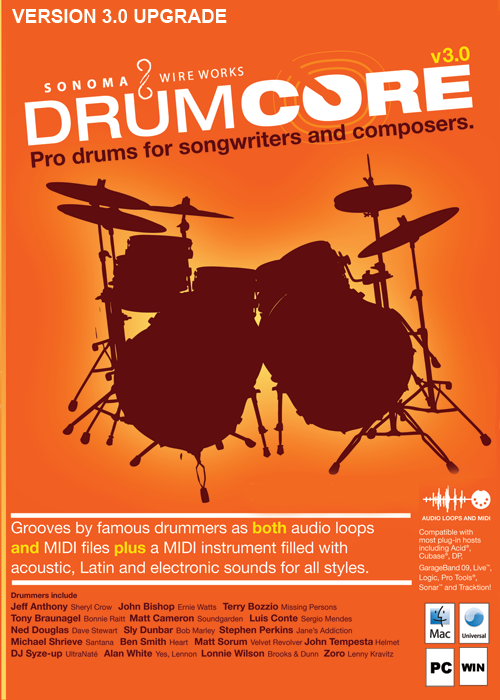 DrumCore 3 includes a plug-in and a standalone tool kit app. The DrumCore 3 plug-in requires a 32-bit host and does not work with a 64-bit host. If you are running a 64-bit host, you can use the DrumCore 3 toolkit to drag the loops into your DAW. A DrumCore 4 plug-in update with 64-bit support is in beta. DrumCore 3 upgrade is only available on DVDs. It is not available as a download. ReWire was included in DrumCore 2.5, but is was not included in DrumCore 3 due to the complexities of including it. As a solution, DrumCore 3 users have the ability to hit play in the DrumCore plugin and then play in the host, which causes DrumCore to sync-up to the host nicely and quickly. This approach is solid and works well. Upgrading to DrumCore 3 is recommended because this is a stable solution, plus there are many improvements in DrumCore 3 listed above. ReWire functionality may be added back into DrumCore in a future update if users prefer that method. DrumCore 2.x users can buy this DrumCore 3 upgrade then order the DrumCore 4 upgrade or only order the DrumCore 4 upgrade. DrumCore 3 or DrumCore 3 Deluxe or order DrumCore 4. Availability: Ships from this U.S. store to everywhere except Canada, Europe, Australia and New Zealand. Email sales@sonomawireworks.com with questions. Sonoma acquired the DrumCore Software and DrummerPack Library and Brands.